Establishing lower pay for new hires, these agreements have undermined union solidarity by opening a gulf between generations. Two-tier wage systems go way back. The Roman Emperor Marcus Opellius Macrinus, in need of a larger army but short on cash, cut the pay for new recruits, forcing them to endure the same battlefield risks as veterans, but at a lower wage. That annoyed the new warriors, and their resentment ignited an army revolt that in 218 ad cost the emperor his life. Centuries later, two-tier wage arrangements are multiplying in America, yet without provoking the kind of public resentment that led to Macrinus’ downfall, mainly because those involved seem to have struck a deal that keeps a lid on passions. In response to persistent demands from employers for lower labor costs, some of the nation’s most prominent unions—instead of protesting or striking—have agreed to reduce the pay of newly hired workers as long as the wages of existing employees go untouched. And the new hires themselves have abstained from open protest, instead preferring the lower tier to no work at all, or to work that pays even less than a union-negotiated lower tier. Finding something better isn’t easy in America—not when more than 20 million people are seeking employment, or hoping to move up from part-time to full-time work, from temporary to permanent jobs, or are too discouraged even to look for work, according to data from the Bureau of Labor Statistics. That labor market slackness, persisting for years, helps explain why corporate employers have gained considerable leverage over wages and benefits, even in negotiations with powerful unions like the United Auto Workers (UAW). One unspoken goal of that leverage is to roll back wages for a younger generation of hourly workers, while pacifying older ones (like Karl’s father) by leaving their pay and benefits untouched in the final decade or so of their careers. The retreat from the middle-class status that unions conferred on so many blue-collar workers is happening gradually. Two-tier schemes, which began to spread in the 1980s, are part of that retreat, undermining union solidarity by separating one generation from another. Older union members acquiesced partly to preserve their own pay and benefits and partly to avoid layoffs. The lower tier would be temporary, they rationalized, and in those early days almost every contract included a sunset provision that brought a flight attendant’s pay, for example, up to the standard wage rate after a certain period. 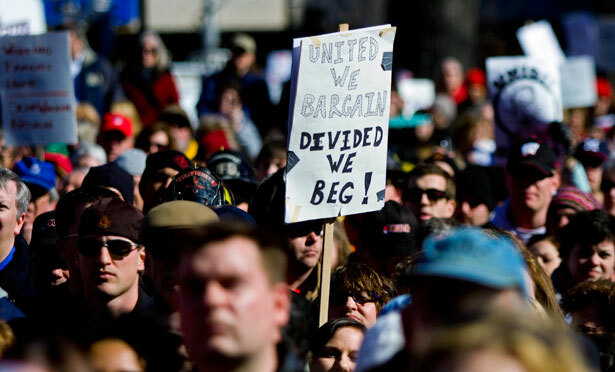 Unions initially wouldn’t tolerate having some members consigned indefinitely to less pay for equal work, and corporate managers seemed to accept that resistance. The better-educated among the bosses may even have known what happened to Emperor Macrinus, and they did not want the “B-scalers” (as those in the lower tier are called) to “increase in political force as their numbers increase,” as Bluestone and a co-author, the late Bennett Harrison, explained in their 1988 book, The Great U-Turn: Corporate Restructuring and the Polarizing of America. These days, however, the B-scalers’ numbers have risen manyfold, and their lower scales no longer merge very often with the ones above. Like the Roman legionnaires, they too could revolt—or, in their case, protest and strike to support union contracts that would meld the two tiers back into one. Instead, they too have acquiesced—as these agreements have rolled back wages by as much as $10 an hour for a younger generation in autos, steel, tires, farm equipment and aircraft production. Beyond manufacturing and airlines, there are two-tier union agreements among retail employees, nurses, supermarket clerks, and state and local government workers. A four-and-a-half-month strike involving grocery stores in southern California in 2003 and ‘04 ended in an agreement that included a two-tier system. In a number of cases, the second tier applies not to the wages of recently hired workers, but to their pensions and health insurance, particularly the former. Fixed monthly pension payments, funded largely by employers, have given way to defined contribution plans, which are essentially interest earned on a retiree’s own savings, supplemented by employer contributions. Or the second tier consists of temporary workers brought in for months at a time to replace higher-paid union regulars who have left or retired. “Perma-temps,” as they are sometimes called, earn permanently less in wages and benefits than regular employees. The tiers vary, although no one formally tracks the variations. But interviews with workers, union officials and managers, particularly in manufacturing, suggest that the lower tier in many contracts is $12 to $20 an hour, versus $20 to $33 an hour for the upper tier. New hires top out over several years at roughly the starting wage in the days when there was only one tier. And there’s another irony: among blue-collar workers, those in manufacturing have traditionally been at the high end of union wage scales, but a $12 starting wage begins to brush against the federal minimum wage (not the current $7.25 an hour, but the proposals before Congress to raise it to $9.80 over three years). “What we are really asking Americans to do is to tough it out for a while,” says Lawrence Mishel, president of the labor-oriented Economic Policy Institute in Washington. And so far they are—but not just for a while. The Occupy Wall Street demonstrations last year seemed to suggest that people might openly resist, but that movement has faded. In the Hoeltge household in Wentzville, just west of St. Louis and a few blocks from the GM plant, Karl is nearly a year into the job his father got him soon after he left community college, where he completed two semesters but did not graduate. Living at home, taking meals with his parents and four siblings, not dating, designing children’s toys, he has managed to save $21,000—a start, he says, but not nearly enough to go out on his own. Until Karl makes it big as a children’s toy designer, the best alternative, he says, is to work at the factory, where he inspects and adjusts the passenger-side doors as the vans come down the assembly line. “Unfortunately, the best jobs you can get around here, other than at the GM plant, pay not much above the minimum wage,” Karl notes. Two-tier agreements are largely a below-the-radar phenomenon. Management and labor don’t call attention to them—from a public relations point of view, they’re a feather in the cap for neither—and I first ran across them almost by chance, during a reporting trip to Milwaukee in the fall of 2010. The city’s unemployment rate had peaked in January of that year at 9.6 percent, in the aftermath of the Great Recession, and had declined only gradually, to 7.3 percent, by December 2012. Elsewhere, the auto crisis had already brought a two-tier system to GM, Ford and Chrysler with the consent of the UAW, which had responded in 2007 to corporate pleas for relief from diminishing profits. That concession drew a lot of national attention. By 2010, I found two-tier systems also in place—with much less fanfare—at three of Milwaukee’s premier companies, all of them solidly profitable: Harley-Davidson, the motorcycle manufacturer; the Kohler Company, famed for its gleaming bathroom fixtures; and Mercury Marine, which makes outboard motors and other marine engines. Of the three companies, only the 900 workers at Mercury Marine had balked, voting at first to reject a contract with a two-tier system. A few days later, the workers reversed themselves after the company announced that in light of the original vote, it would consolidate production at an existing factory in Stillwater, Oklahoma, and close the one near Milwaukee. In their panicked response, the workers approved a 30 percent pay cut for new hires as well as for veteran employees called back from layoff. And this at a company whose production workers were—and still are—members of the powerful International Association of Machinists. In our January 7-14 issue, Josh Eidelson wrote that the new labor campaign against Walmart faces daunting odds, and the stakes are high: most of us live in the Walmart economy.